Celebrate, like the Champion that you are! Saturday June 2nd, 9am to 11:30am. 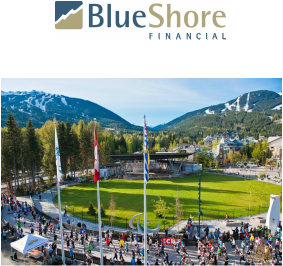 Join us at Whistler Olympic Plaza for our Athlete Celebration and Awards Ceremony, presented by BlueShore Financial - celebrate your race accomplishments with friends, family and other athletes. Whistler Olympic Plaza is Whistler's premier outdoor gathering spot and will be the place to hang around after the race, watch the Whistler Kids Run, and have your chance to win great prizes. There will be live entertainment, kids activities, games, awards, race merchandise sales, sponsor samples, and door prizes too. Awards will be presented on stage to overall 1st, 2nd, and 3rd in each race and gender for participants, age category awards will be awarded next to the stage all morning long - that way you can pick up your age category award at your convenience rather than having to be there at a specific time. Just check the results as they are posted to see if you finished 1st, 2nd or 3rd in your age category. Door Prizes galore will be available to participants by playing a variety of games. No need to sit around and wait to see if your bib number is called, check the list of door prize bib winners and collect your prize at the "Door Prize" sign. Tickets are not required, just bring yourself, friends and family; and have a great time!